a Departamento de Zootecnia, Universidade Estadual Paulista, Jaboticabal, Brazil. b ETCO-Grupo de Estudos e Pesquisa em Etologia e Ecologia Animal, Jaboticabal, Brazil. c Agriculture and Agri-Food Canada, Dairy and Swine R & D Centre, Sherbrooke, Canada. d EMBRAPA Swine and Poultry, Concórdia (SC), Brazil. e Cooperativa Central Aurora Alimentos, Chapecó (SC), Brazil. ABSTRACT. A total of 1,728 pigs were transported to slaughter using two double-decked trucks, one featuring a hydraulic deck (HD) to load and unload the upper level and the other presenting a fixed upper deck (FD) only accessible by a ramp. The aim of the research was to evaluate the effects of the loading and unloading system of the truck on behaviour, blood parameters (cortisol, lactate and creatine kinase [CK]), skin lesions and meat quality traits. The use of HD resulted in easier and faster loading (P < 0.05 for both) compared with the FD. Blood cortisol levels were influenced by the loading/unloading system, with lower (P < 0.05) levels being found in pigs using HD transport when compared to those using FD transport. Truck type had no effect on the incidence of skin lesions and pork quality in this study (P > 0.05). It can be concluded that the use of the truck model featuring the upper hydraulic deck should be recommended to ease of handling at loading improving animal welfare and reducing the work load of handlers. Key words: transport, handling, blood parameters, skin damage. RESUMEN. El objetivo del trabajo fue estudiar los efectos del sistema de carga y descarga de camiones de dos pisos en el comportamiento, parámetros fisiológicos (cortisol, lactato, creatina quinasa [CK], lesiones en la piel y la calidad de carne de los cerdos). Para ello, 1.728 cerdos fueron transportados a una planta faenadora de carnes utilizando dos camiones de dos pisos con diferentes sistemas, uno con piso hidráulico (HD) para el carga y descarga desde la planta superior, y otro con piso superior fijo (FD), accesible solo por medio de rampas de carga y descarga. El uso de HD resultó en una mayor facilidad y un menor tiempo de carga (P < 0,05 para ambos) en comparación con el FD. Los niveles de cortisol de los cerdos fueron influenciados por el sistema de carga y descarga, encontrándose los niveles más bajos (P < 0,05) en los cerdos transportados con HD en comparación con con FD. El modelo del camión no afectó la incidencia de lesiones de la piel y la calidad de la carne de los cerdos en este estudio (P > 0,05). Por tanto, se puede concluir que el uso de modelos de camiones equipados con piso hidráulico puede ser recomendado para aumentar la facilidad de manipulación de los cerdos durante la carga, y por consiguiente, reducir la mano de obra de los trabajadores y mejorar el bienestar animal. Palabras clave: transporte, manejo, parámetros sanguíneos, lesiones de piel. Transportation is considered as the most stressful event for pigs prior to slaughter (Geverink et al 1998) which may compromise the welfare of animals and ultimately pork quality (Warriss 1998, Von Borell and Schaffer 2005, Schwartzkopf-Genswein et al 2012). The vehicle design plays a major role contributing to the incidence of animal losses during transport (Dewey et al 2009), with higher proportion of losses being associated to the use of trucks equipped with ramps when compared to vehicle equipped with hydraulic decks (Kephart et al 2010, Correa et al 2013). Research showed that loading and unloading pigs through ramps impose a strong physical exertion on pigs as showed by the higher heart rate (Correa et al 2013, Goumon et al 2013) making them hard to move in and off the vehicle and increasing the use of electric prods, all resulting in longer handling time (Torrey et al 2013). The results from comparative studies including trucks featuring ramps or hydraulic decks as regards pork quality are rather inconclusive, ranging from no effect (Correa et al 2013) to improved pork quality (Dalla Costa et al 2007, Weschenfelder et al 2013). Due to economic reasons, the use of double and triple-decked trucks for the transport of pigs is rapidly increasing in Brazil (Dalla Costa et al 2007). However, not all truck models are equipped with hydraulic decks, and those that are not, use steep ramps (>20°) to load on and off pigs located on the upper deck. It has been shown using ramps which are too steep reduces the ease of handling and results in greater physical effort for pigs and handlers as shown by increased heart rate (Goumon et al 2013). However, to our knowledge there are no studies on the effects of these truck models on the welfare and meat quality of pigs in Brazil. 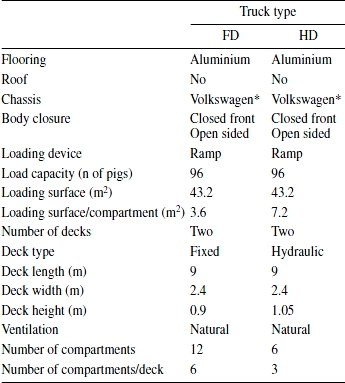 Therefore, the aim of this study was to compare the effects of two commercial double-decked trucks, one with fixed upper deck (FD) and the other with hydraulic upper deck (HD) on pigs' welfare, handling efficiency, and carcass and meat quality traits. All experimental procedures performed in this study were approved by the Sao Paulo State University's Animal Research Ethics Board (protocol number 6119-08). A total of 1,728 crossbred pigs (BW of 115 ± 2.3 kg) were transported from nine commercial swine farms to a commercial abattoir located in Santa Catarina state (Brazil) over a distance of 78 km (± 13) average, with 70 km (± 9 km) on paved road and 8 km (± 5 km) on dirt road. Transport trials were run during the summer 2009 at an average ambient temperature during the transport of 17.5 °C (range from 16 to 22 °C). All farms consisted of only one finishing facility with similar design and capacity to finish 450 pigs (± 25) per cycle (170 days). Pigs were kept in pens (10.4 ± 0.4 pigs/ pen) on concrete floor at an average density of 1.15 m2/pig. Once the slaughter weight was achieved, pigs were fasted for 12 h before loading. At each farm, pigs were loaded in groups of 4 pigs each by trained handlers using paddles and rattles. Each farm had a loading ramp (10.5 ± 0.5 m long) which could be adjusted to load pigs on the bottom and the upper deck (15o and 20o slope, respectively) of the truck. In this study, the two trucks and drivers were the same on each journey (9 journeys) to the slaughter plant. The trucks (Triel-HT, Erechim, Brazil) were of double-decked type either featuring a fixed or a hydraulic upper deck (FD and HD, respectively). A technical description of both trucks is presented in table 1. In both trucks pigs were transported for 118 min (± 37) at a density of 230 kg/m2. In the FD truck pigs were distributed into 12 compartments (6 per deck) holding 8 pigs each, while in HD truck pigs were transported in 6 compartments (3 per deck) holding 16 pigs each. Table 1. Technical features of the vehicles used. Características técnicas de los vehículos usados. Loading time was recorded from the moment the first pig nose crossed the farm gate until the rear leg of the last pig crossed the truck gate. Similarly, unloading time was recorded starting from the instant the gates of the truck opened until the rear leg of the last pig crossed the truck gate. The ease of handling at loading and unloading was scored by trained observers using a subjective scale ranging from extremely difficult (score 1) to extremely easy handling (score 5). It was based on an appraisal of the frequency of slips, falls, vocalizations, pig stopping and contacts between handler and pigs. Higher scores meant a lower number of slips, falls, vocalizations, pig stopping and contacts between handler and pigs which was considered better than low scores. Slips and falls were defined as when one leg of a pig splits away from the other opposite leg or when a pig falls down (at least 2 legs buckled under) with some part of the body physically touching the floor; vocalizations were any squeals produced by the pigs and did not include grunts; pig stopping was when a pig stops for more than approximately 2 seconds; and contact between the handler and pigs was any contact when the handler used his voice or touched the pigs by hand, paddle or board to encourage forward movement of 1 or the group of pigs. On arrival at the slaughterhouse, pigs were unloaded with an adjustable-slope metal ramp (5 m length) with anti-skid floor. To reach the FD the ramp slope was adjusted to 10° slope, while for unloading pigs from HD the ramp was kept level. In the lairage, pigs from different trucks were kept in separate pens (no mixing). After 6 h lairage, pigs were driven to slaughter using a paddle, boards and rattles, electrically stunned (head-to-chest electrical stunning) and exsanguinated in the horizontal position. After slaughter, carcasses were eviscerated, split, and chilled according to standard commercial practices and kept in the cooler at 1-4 °C for 24 h pending cold deboning. Blood samples (10 mL) were collected from 432 pigs using vacuum tubes (Vacuplast, Cral Artigos para Laboratorio Ltd., Sao Paulo, Brazil) from sentinel pigs (2/compartment in the FD truck and 4/compartment in the HD truck for each journey), in order to extract serum for creatine kinase (CK) and cortisol analysis. Another 2 mL of blood was collected in a tube containing 3.0 mg of sodium fluoride and 6.0 mg of Na2EDTA solution to extract plasma for lactate analysis. Samples were immediately centrifuged at 4 °C for 12 min at 1,400 g. Plasma was transferred into 1.5 mL Eppendorf tubes and stored at -80 °C until lactate determination. Serum samples were kept at room temperature (~23 °C) for 1 h before refrigeration at 4 °C. The following day, serum samples were centrifuged at 4 °C for 12 min at 1.400 g, transferred into 1.5 mL Eppendorf tubes and stored at -80 °C until analysis. Lactate levels were measured using a commercially available kit (Lactat PAP enzyme Farbtest, Rolf Greiner Biochemica, Flacht, Germany) and CK levels were determined with creatine kinase-kit (CK-NAK FS, Diasys-Diagnostic Systems Internacional, Holzheim, Germany). Plasma lactate concentrations were determined with a microplate reader and serum CK concentrations were determined with a spectrophotometer. The quantitative determination of cortisol was made using a commercial kit (Coat-A-Count Cortisol Kit, Diagnostic Products Corporation, Los Angeles, CA) with a microplate reader and expressed in ng/mL. The intra-assay CV was 28.3, 34.3 and 45.2% for CK, lactate and cortisol, respectively. Skin lesions were evaluated in a total of 432 pigs, and the same pigs were used for physiological measurements. The number of skin lesions was counted on the left side of the body of the same pigs evaluated in each phase of preslaughter handling, such as at the farm (one day before loading), at unloading and in the lairage pen, and the percentage of pigs showing lesions was calculated. In the cooler, on each left carcass side skin lesions were classified as fighting type lesions (1 = less than 10 lesions; 2 = 11 to 20 lesions; and 3 = greater than 20 lesions) or mounting (score 1 = less than 5 lesions; 2 = 6 to 10 lesions; and 3 = greater than 10 lesions) by visual assessment of shape and size according to the photographic standards of the Institut Technique du Porc (ITP, 1996) as described by Faucitano (2001). According to the ITP scale, lesions due to biting during fighting are 5 to 10 cm in length, comma shaped, and mostly concentrated in the anterior (head and shoulders) and posterior (ham) regions of the carcass. Long (10 to 15 cm), thin (0.5- to 1-cm-wide), comma shaped lesions densely concentrated on the back of pigs caused by the fore claws were classified as mounting type lesions (Correa et al 2014). Meat quality was measured in 432 carcasses of the same pigs used for carcass evaluation. Muscle pH was assessed at 45 min (pHi) and 24 h (pHu) post-mortem using a pHmeter (HI 8314 model, Hanna Instruments, Sao Paulo, Brazil) fitted with a spear type electrode (HI 1217D, Hanna Instruments, Sao Paulo, Brazil) and an automatic temperature compensation probe (Tec 530, Hanna Instruments, Sao Paulo, Brazil) by insertion into the Longissimus dorsi (LD; between the 13th and 14th rib) and Semimembranosus (SM) muscles. Instrumental colour (L*, a* and b* values) of the LD and SM muscles was evaluated 24 h after slaughter with a Minolta Chromameter (CR-400; Minolta Camera Ltd., Osaka, Japan) equipped with a 25 mm aperture, 0° viewing angle, and D65 illuminant. Visual color was evaluated using the NPPC Pork Quality Standards (National Pork Producers Council, 1999). Drip loss was measured in the LD and SM muscles using a modified EZ-driploss method (Correa et al 2007). Briefly, two 25 mm diameter muscle cores were removed from the center of 2.5 cm thick LD (removed at 13th/14th last rib) and SM muscle chops, weighed and placed into plastic drip loss containers (KABE Labortechnik, Umbrecht-Elsenroth, Germany) at 24 h post-mortem and stored for 48 h at 4 °C. At the end of the 48 h storage period, muscle cores were removed from their containers, surface moisture was carefully dabbed, cores were reweighed, and drip loss percentage was calculated by dividing the difference between initial and final core weights by the initial core weight. To assess cooking losses, four LD muscle chops (150 g) were vacuum-packed in heat resistant sealed plastic bags and cooked in water bath at 80 °C for 1 h. Chops were then placed on absorbent paper to remove surface moisture and weighed when the internal temperature reached 20-25 °C. The weight loss was calculated by difference between initial and final weight (Honikel 1998). The same LD muscle chops were then cooled at 0 °C for 12 h and used for the determination of Warner-Bratzler shear force. Five rectangular cores (1 x 1 x 2 cm), parallel to the longitudinal orientation of the muscle fibers, were taken in each chop and analysed using a Warner-Bratzler device attached to a TAXT2i Texture Analyzer (Stable Micro Systems, Survey, UK). The meat quality classification was calculated according to quality criteria set for this study (table 2, based on Flores et al 1999 and Faucitano et al 2010). pHu y color (valor de L*). firm and non-exudative; DFD: dark, firm and dry. 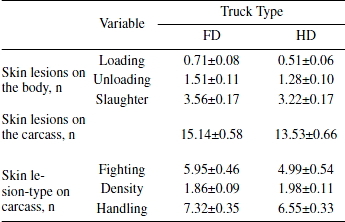 Variance analysis using GLM SAS (2003) was applied to study the effects of truck type on quantitative variables, such as Cortisol, lactate, CK, pH, color, drip loss and cooking losses, with the group as experimental unit for the analysis of easiness of handling data and the individual as the experimental unit for the analysis of physiological and meat quality data. The likelihood ratio and chi-square tests were used to compare the easiness of handling, skin lesion-type categories and meat quality classification. The two tests were performed using the FREQ procedure of SAS (2003). The use of HD shortened the time to loading and unloading the truck (44±5 and 15±2 min, respectively; P < 0.05) compared with FD (50±11 and 19±3 min, respectively; P < 0.05). The shorter loading and unloading time in the HD truck may be explained by the easier handling at loading and unloading (scores = 4.0 and 3.4, respectively; P < 0.05) compared with the FD truck (scores = 1.5 and 1.3, respectively; P < 0.05). These results are not surprising as they confirm the significant improvement in the easiness of loading and unloading pigs when hydraulic systems are used instead of sloped ramps (Brown et al 2005, Torrey et al 2013, Weschenfelder et al 2012, 2013, Garcia and McGlone 2015). The aforementioned observations are relevant to the performance of pre-slaughter phase because an increase in loading and unloading times, associated with handling difficulties, may prompt exhaustion of handler team and lead to losses in manpower quality. Except for blood cortisol levels, truck type had no effect on the other blood stress parameters assessed in this study (P > 0.05; table 3). 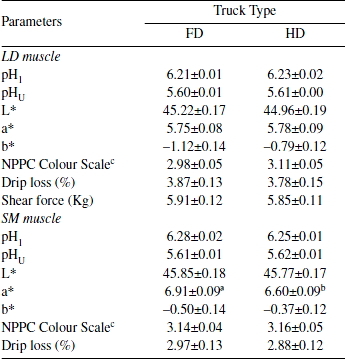 Pigs transported on the HD truck showed lower (P < 0.05) blood cortisol levels than those located on the FD truck. Reduced exsanguination blood cortisol levels in pigs handled using hydraulic systems compared with ramps were previously reported by Ludtke et al (2012) and Weschenfelder et al (2012) and would indicate that incomplete recovery from the psychological stress of negotiating a ramp in FD pigs. Table 3. 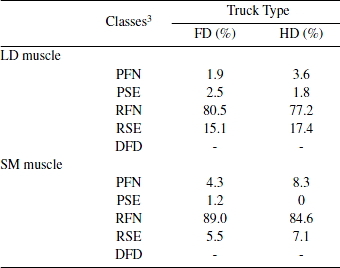 Effect of truck type (FD or fixed deck vs.
HD or hydraulic deck) on blood stress indicators1. Efecto del tipo de camión (FD o piso superior fijo vs.
During preslaughter handling, salivary cortisol levels can treble and they do not recover to their initial levels until 3 hours of lairage (Dalla Costa et al 2008), confirming that this hormone can be considered a relatively long-term stress response (Weschenfelder et al 2013). The blood lactate usually returns to basal levels within 2 h after physical exercise (Correa et al 2013), but in the present study stress was continuous up to the time of slaughter and this may explain the lack of treatment effect in this variable. Nevertheless, the blood lactate levels at exsanguination were greater than 4 mM in both treatments, which is the resting level of blood lactate for market-weight pigs (Edwards et al 2011). This reflects a general state of fatigue in pigs transported by both truck types. On the other side, the CK level achieves a peak within 6 hours after physical stress and does not return to basal level until 48 hours (Correa et al 2013), implying that the physical stress of climbing the ramp was not intense enough to create a treatment difference. The evidence that the effects of the ramp were more psychological than physical in this study is provided by the lack of effect of truck type on the variation in exsanguination blood lactate and CK level, both indicators of physical stress. Ludtke et al (2012) also failed to report variation in blood lactate and CK levels in pigs transported in similar Brazilian truck types. As previously reported by Dalla Costa et al (2007, 2009), in this study the incidence of pigs presenting skin lesions increased from farm (32.3%) to slaughter (96.6%) with loading, transportation and unloading being responsible for 36.2% of the increase while 28% was caused by lairage. However, similarly to previous studies (Nanni Costa et al 1999, Weschenfelder et al 2012, 2013, Correa et al 2013), in this study loading and unloading pigs using an hydraulic system did not influence skin lesions in neither live pigs nor carcasses (P > 0.05; table 4). Since a higher number of pigs in one compartment increases the probability of contacts between pigs, there could be an effect of truck type on the incidence of pigs with skin lesions at unloading and on the number of carcass lesions. However, when the density is within the guidelines of the EU, the group size effect is not significant. These results may indicate that when pigs are handled gently in small groups using proper handling tools, the impact of loading/unloading equipment in the truck on skin lesions is not important. Table 4. Effect of truck type (FD or fixed deck vs.
1Mean values and standard deviation. Except for Minolta colour a* (meat redness) assessed in the SM muscle, truck type had no effect on the meat quality parameters evaluated in this study. A greater (P < 0.05) Minolta a* value was recorded in SM muscle of HD pigs (table 5). The distribution of meat quality classes (PSE, PFN, RSE, RFN, DFD) was not affected (P < 0.05; table 6) by the treatments. However, this result is not economically important as the a* value is still within the range of normal meat quality. Other studies also failed to find effects of hydraulic vs. ramp use at loading and unloading on meat quality traits (Dalla Costa et al 2007, Ludtke et al 2012, Weschenfelder et al 2012). The distribution shown in table 6 is in agreement with Araujo (2009) who evaluated the meat quality in pig abattoirs in Brazil. The RFN is the most desirable meat for the pork chain, and had the highest incidence in both studies. On the other side, the studies found a low incidence of PSE defect in pork. As with the study by Araujo (2009) in which the conditions were very similar to this study, the frequency of DFD defect was very low. Table 5. Effect of truck type (FD or fixed deck vs.
Longissimus dorsi (LD) y Semimenbranosus (SM). (LD) and Semimembranosus (SM) muscles2. Longissimus dorsi (LD) y Semimembranosus (SM). 1 See Material and methods (table 2) for more details. It is possible to conclude that the use of the hydraulic deck in the truck to load and unload pigs improves the efficiency of transport in terms of time and easiness. However, it is suggested that when pigs are well handled in these phases the impact of the vehicle design on skin lesions and meat quality variation is minimal. The authors appreciate the assistance of L. C Ajala, E. L. Klein and D. da Silva, for the data collection at the slaughter plant and laboratory analysis. Sincere thanks go to the CNPQ (National Council of Technological and Scientific Development) for granting a Master scholarship to Filipe Dalla Costa. The authors are grateful to Swine and Poultry Research Centre of Embrapa for the financial support and to Cooperativa Central Aurora Alimentos and Cooperativa Regional Itaipu for the financial support, manpower, and facilities usage.